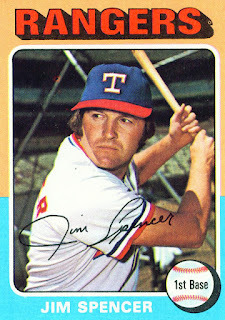 Texas Rangers Cards: 1975 Topps - Jim Spencer. 1975 Topps - Jim Spencer. So far there is no major news out of the Rangers Spring Training camp. Time to take another look at 1975. Jim Spencer appears here on card number 387 of the 1975 Topps set. 1975 was a pretty good year for Jim Spencer. He was able to hang on to the starting first baseman's job for the season. In 132 games Spencer put in 770 innings at first. He also committed an unusually high number of errors with five on the year. That gave him a .995 fielding percentage - low for him but still five points above the league average. Jim went to the plate 443 times in 1975. He would post a .226 batting average and a .327 on-base percentage. Those numbers would include 18 doubles, one triple, and 11 home runs. While Jim had beat Mike Hargrove in the battle for first base in 1975 the victory would be short-lived. Spencer's glove was better than Hargrove's but his bat just couldn't keep up. With several utility players able to man first on occasion, Texas just didn't need two starting first basemen. On December 10, 1975 they traded Spencer and some cash to the Angels for pitcher Bill Singer. Minor League Monday - Brian Romero, 1990 Best. Senators Saturday - Jim Hannan, 1963. 1975 Topps - Dave Nelson. Minor League Monday - Barry Winford, 1990 Best. Senators Saturday - Chuck Cottier, 1963. 1975 Topps - Jim Merritt. Senators Saturday - Marv Breeding, 1963. Best Seasons: Will Clark - 1998. Cross Cruz off arbitration list. Rangers avoid arbitration with Andrus. 1975 Topps - Joe Lovitto. Minor League Monday - Timmie Morrow, 1990 Best. Senators Saturday - Steve Hamilton, 1963.